There have been some nail-biters this basketball season! As you may know, we beat Harvard in the NCAA playoff game with an AMAZING buzzer-beater by Douglas Davis, final score: 63-62. We won by one glorious point. And Harvard STILL hasn't been to the NCAA since 1946. Mwahahahaha. Photo courtesy of Gabe Eggers '13. If you haven’t seen the buzzer-beater, check out the following videos. http://vimeo.com/20973769?SPSID=46553&SPID=4231&DB_OEM_ID=10600 (this is my favorite of all videos I’ve seen. Harvard’s #10 looks pretty silly when he is trying to heckle Dan Mavraides teeheehee). http://www.youtube.com/watch?v=He4pujjuilw (this is what was on ESPN3). 1.) There were 2.8 seconds left on the clock, we were down by one. I don’t think that I had given up hope, although I chose to watch the final seconds when usually I choose to look away during the stressful parts, so who knows. 2.) Douglas Davis went all over the place with the ball. But eventually it left his hands. 3.) I remember seeing the ball arc through the air as the backboard lit up red. 4.) The shot was good. 6.) I was afraid the Harvard fans were going to beat us up but they didn’t. And, let’s go to Tampa! Hopping off the charter plane. We are quite the jet-setters. Photo courtesy of Kristen Davila '11. And we sat by the pool. Hey Harvard, wish you were here! Photo courtesy of Wendy Pan '14. And of course we went to the game! Kentucky University versus Princeton University. We played tough. We slowed them down. The Band rushed at least 4 Kentucky shots by mis-counting-down the shot clock. UK didn’t know what hit them. Plus their band was way less cool than ours. Like, infinitely less cool. We may have lost 59:57, but Kentucky is now in the Final Four. So not too shabby, if I do say so myself. We got to hang out "backstage" with a Powerade open bar. Swanky. Left to right Kynan Rilee '12, Jaxi Nestor '12, Kyle Wass '13. Photo courtesy of Kristen Davila '11. So much coolness encompassed in that one high-five. Princeton Tiger Mascot and Alec Slatky '12. Photo by Gaby Stember-Young WCC '13. 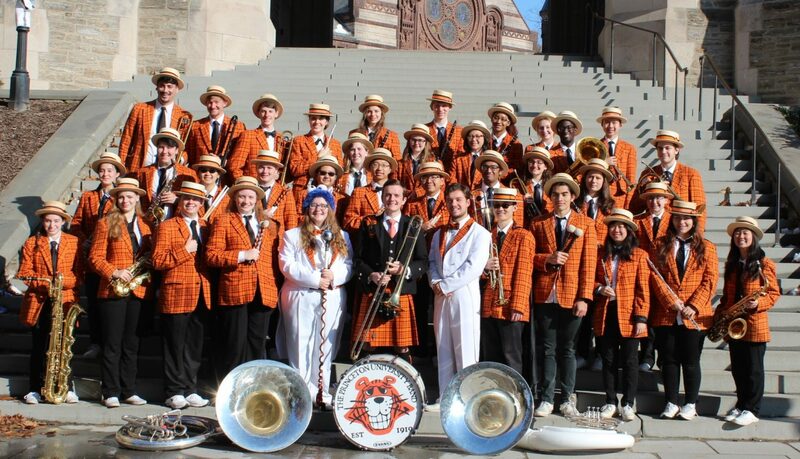 Lookin' good, Band. Photo courtesy of RW Enoch '09. The Band makes funny faces in front of the Capitol building. Oh, Band... Photo courtesy of Sterling Chu '13. And here they are at the game! Tom Scherer 'GS on tuba. Photo courtesy of Sterling Chu '13. And now, drumroll, Reunions are coming up!! Alumni should fill out their attendance surveys if they will be “go[ing] back to Princeton at commencement time, sampling each Reunion, that’s the life for mine oh baby” etc. I hope to see you all very soon! And thanks to everyone who provided the pictures that I have used here.